Global Voices Online's Salam Adil gives a round-up of what the Iraqi blogosphere has been talking about in the past week. There are few images that can relate the true human impact of the violence in Iraq. MixMax found just such an image. 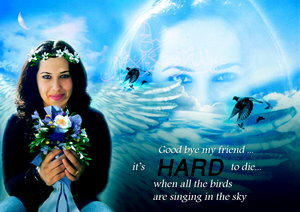 Designer, Zahraa812graphic posts on DeviantArt a touching tribute to her dead cousin. I thought I share this tribute with her and put the picture on my blog. God Bless her soul and of all innocent Iraqis, and may god protect Iraq and the Iraqis from any harm. Today I continue from my last post trying to make sense of he latest developments in Iraq, but first my deepest condolences goes to Alive in Baghdad reporter Hayder Fahad whose sister was killed when American soldiers opened fire on a minibus carrying bank employees on their way to work. [On Wednesday], after school, the girls and I started discussing matters about the party we were planning to have on the next day at school, what food to bring and what to wear, and in my way home I was talking with my friend who’s 2 years younger than me about the party, music, etc… the driver suddenly asked us not to look at the right side, before he finish his sentence I saw murdered man thrown in the middle of the street, with A lot of blood round him. I came home with my face red and trying to hold my tears.. in the next day I was feeling better, and I got through that.. the party was good, but many girl couldn’t attend . I reported recently on a new movement called Awakening which was credited with bringing order back to the more violent parts of Baghdad and how reports are filtering through of a marked reduction of violence in the capital. Last of Iraqis looks at recent events and sees them as part of a big plan. In 2 weeks, things have really improved in what used to be called “Hot zones” like Adhamyia, Alamria and Aljamiaa after more than a year and a half while other areas are the same, the situation improved in less than two weeks??! While no one even dreamed that it can improve! How could that be? If it's that simple why didn't they do it long time ago? It wasn't that hard, just big cash to give and that's it. I must say that the awakening movements and the improvements is a really great thing and I'm so happy with it, and I wish the security situation improves much more so we can be as near to normal as possible, but I have one question in mind; who pays the salaries for the awakening members? When you know the answer you will know that all what I have said is true, you will know that they could do this long time ago but they didn't because it wasn't the right time yet and you will finally know that it's all part of the big plan, and few who knows what are the coming chapters in it. What I feared from has occurred, the relative peace and quietness that we have witnessed in the past couple of weeks was just for terrorist's re-evaluation, it seems that the terrorists from all the sides were just planning what to do next, they were planning how to overcome the current changes and achievements, I don't know why but they always seem to succeed, why can't we have peace for at least a month? The Awakening forces will kill Shiites if they find them in the neighborhood. “Americans know about it but they don’t do anything,” he said. Americans provide weapons for these men and support them, and pay them the salary of a soldier in the Iraqi army. What I’m trying to say is that although some people are saying that Baghdad seems a bit “safer”, that doesn’t mean that the Iraqi or the American forces have done a great job of chasing down these terrorists. Rather, it is because now both, the Iraqi and the American governments are sponsoring them. Instead, I believe all these terrorists, who have left scars of their crimes all over the country, should all be tracked down and arrested and at least be put in jail. Other wise, Baghdad should not be described as safe. There are very few who consider the drop in violence in Baghdad a positive development as it is based on shaky foundations. And some have their own theories for the causes. So, after all, the drop in U.S. military losses was not so much the “success” of the surge in American forces, but thanks to Iraq’s government and Iran’s “cooperation”. A cab driver once told me, oh I'm sure you have fled your ravaged country and wanted a peaceful place. Our country is beautiful [not like yours]. This is when the evil aggressive me shows up. First off, I didn't flee, had it not been my job I'd take the first plane and fly back home and would not be any happier. Secondly, trash-strewn or spotless, lush or arid, my country is more beautiful in my eyes than yours, because there in my country we spoke the same language, we all talked petrol, ration cards, car bombs, power outages, tomato prices, the greedy generator keeper, the scary commandos, the wretched phone company, water cuts, new killings, those stupid Humvees lurking nearby.